is well worth the spectacular scenery that awaits." This may be our last pretty day for a while. It was 60 F. and sunny when I got up at 6AM, with a few puffy clouds to the east. Sunrise was about 4:16 AM, sunset last night about 11:43 PM. Amazing. Not only is it light when we go to bed and get up, the SUN is still shining!!! I love this "Midnight Sun" concept. Temps got to the mid-70s F. at Black Spruce Campground this afternoon. 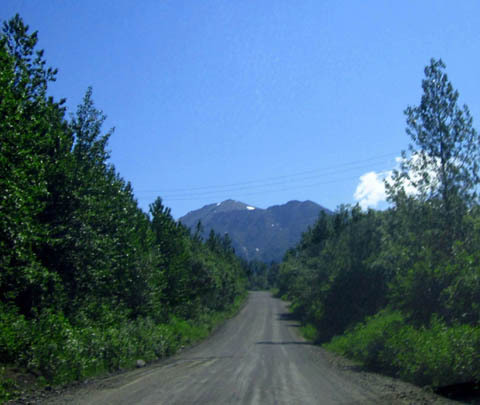 There are so many microclimates around the Anchorage area that I usually just record what�s happening at the campground (it is similar to the official weather station at the airport a little farther south in Anchorage). It's several degrees cooler when I'm hiking at higher elevations in the mountains. Jim left for a 21+ mile bike ride on base about 11 AM. He's been all over the place and is still finding new bike paths and roads to explore. JBER is huge. I'll write more about his rides in another entry. It took me a while to get motivated to go hike. I didn�t leave the campground with Cody until 1 PM. 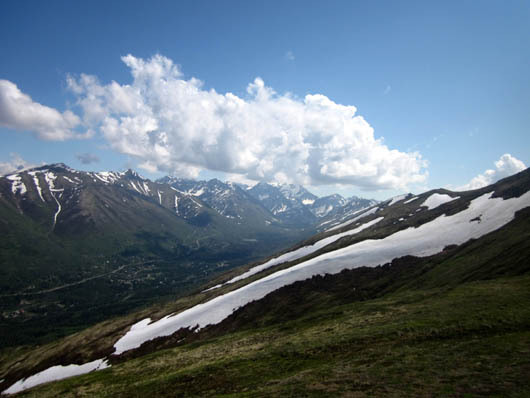 I drove about twelve miles to the Arctic Valley trailhead for a loop around and to the summit of Rendezvous Peak in Chugach State Park. 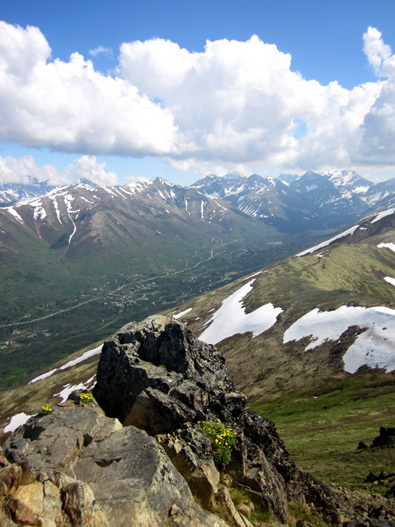 This appears to be the nearest trailhead for me to go hiking in the Chugach Range. 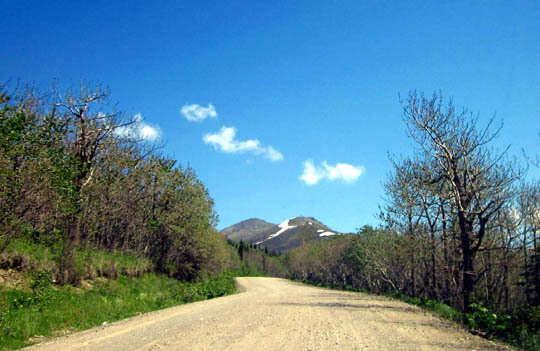 Arctic Valley is north of the Hillside Trail System, closer to Eagle River. 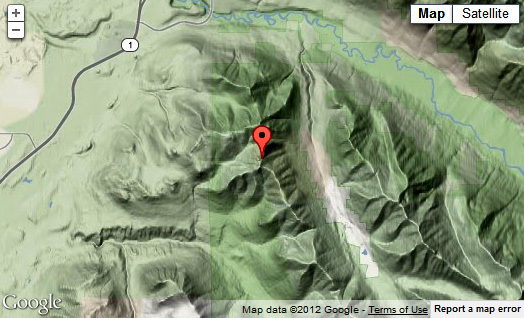 Google topo map showing Rendezvous Peak; I got that from the website link above. Arctic Valley Rd. can be accessed off the Glenn Hwy. at MM 8 from the north or MM 7 from the south. It is paved for about one mile past a golf course. The last six miles are dusty gravel with some washboard surface. Most of the road passes through military property and may be closed down during certain training operations or for security reasons, as in the immediate aftermath of 9-11. I drove up from about sea level at our campground to 2,600 feet at the trailhead, which is on Alpine Valley Ski Area property. 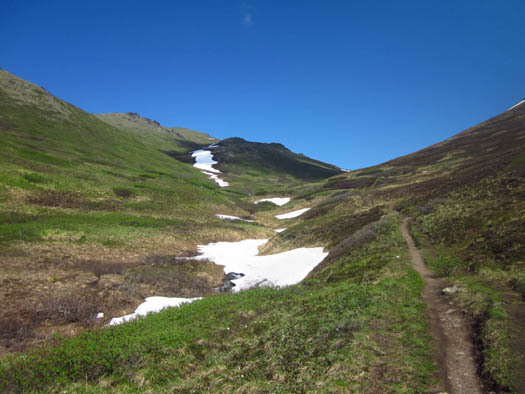 It was interesting to see the changing plant zones as I ascended from all the bright green leaves and grasses in the valley to bare deciduous trees and then to the low sub-alpine shrubbery at the trailhead. 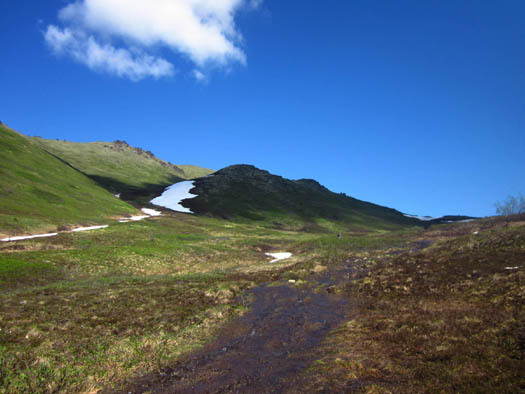 Much of the trail to the peak was in the alpine zone (tundra). 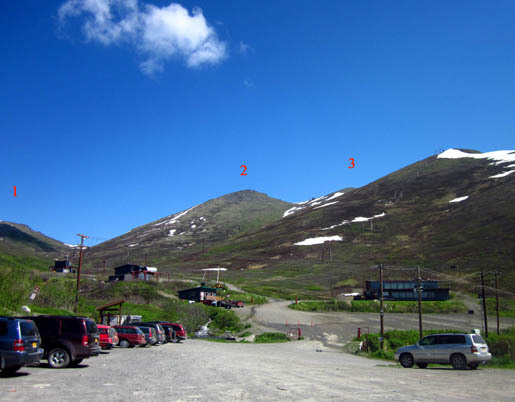 Parking at Arctic Valley is in a very large two-tiered gravel lot near the Alpenglow ski lodge. Apparently every vehicle must pay $5 for a day pass. I don't know if skiers can get a season pass in the winter. Even though most of the trail I hiked was in the state park, folks with the annual state park pass must also pay since the parking lot is on ski property. You can park free if you leave your vehicle about one-half mile down the road, just before the ski resort, and walk up the road to the trailheads. I might do that if I go back up there again. 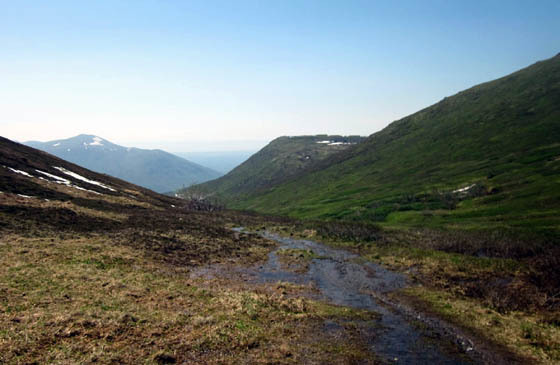 I talked with two local guys who parked next to me re: where the trail goes because there is no map at the trailhead, the Chugach State Park map is vague about this area, and I hadn't looked online for any information yet. 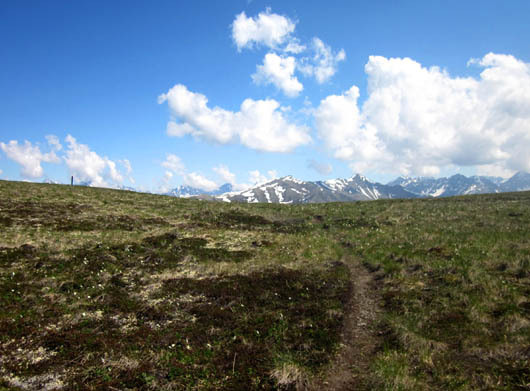 I knew that the main trail to the peaks splits into two about half a mile from the trailhead, with one trail swinging around the left side of Rendezvous in a big arc and another trail taking a much steeper, more direct route to the saddle between Rendezvous and Little Teton. The guys told me the advantages and disadvantages of both ways. I wasn't in any hurry so I took the longer, more gradual trail up and planned to go down it, too. 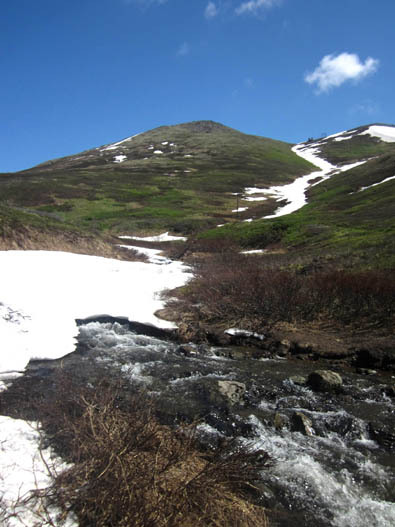 There are many hiking variations you can do from this trailhead. I'll mention some of them as I describe the route I took. 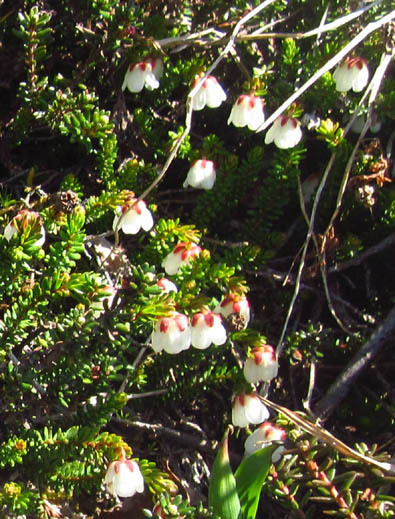 is a dwarf evergreen shrub I found growing at about the 2,800-foot level. 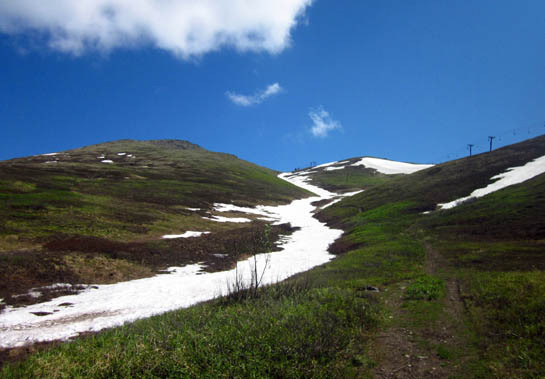 Since most of the terrain is low brush or tundra you can also just strike off on your own cross-country route to reach the various ridges and peaks or to access prime berry-picking areas in late summer. That's not so great for fragile plants in sensitive areas but all the renegade trails indicate people have been doing it for a while. I started from the parking area at about 2,600 feet elevation, which was above treeline at this location. The lodge and a restaurant/ski shop are behind a gate at the bridge over Toklat Creek. The gate was open all day today. If it is closed just walk around it, go past the ski shop, and continue up the wide dirt path. It's hard to see in this small photo but there's a bridge across the creek to the left of the trail. 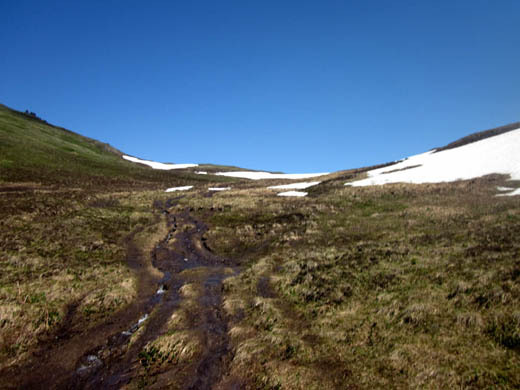 The trail was dry for the first half mile along Toklat Creek. A bridge crosses the creek and leads to another, less-traveled trail that appears to parallel the main trail uphill on the other side of the creek. 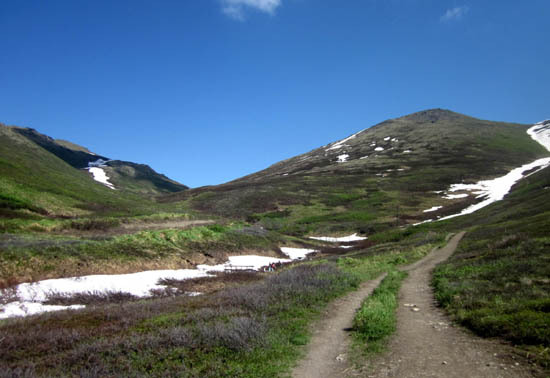 I might try that trail if I go back up to Rendezvous again. 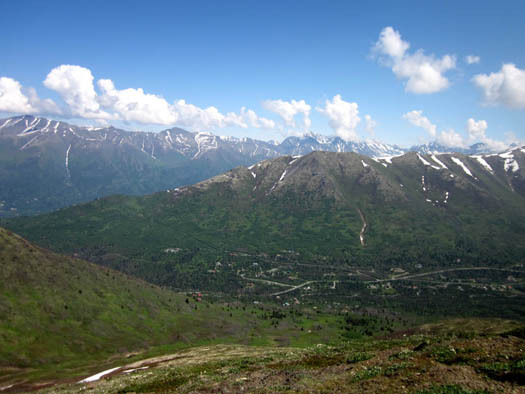 I can access the long ridge to the left, which ends at Gordon Lyon, by hiking up one of those mountains. 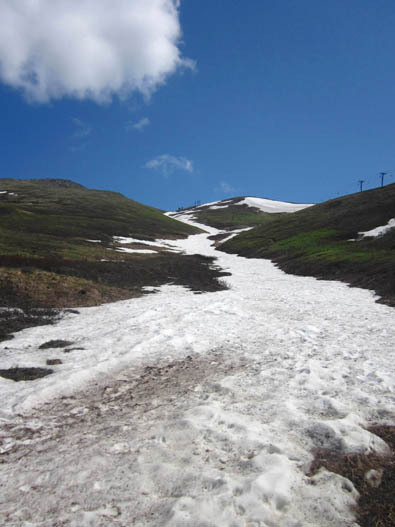 Today that trail was still partly under the snow so I didn't take it up. The scenery along this creek reminded me of the old Colorado Trail in the Pole Creek area before Segment 23 was rerouted along the Continental Divide. 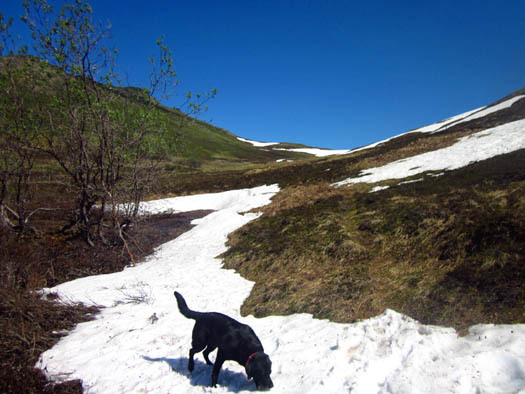 It looked like the snow had very recently melted over much of the ground around me. Until I reached the first saddle I saw very few flowers and not much that had greened up. 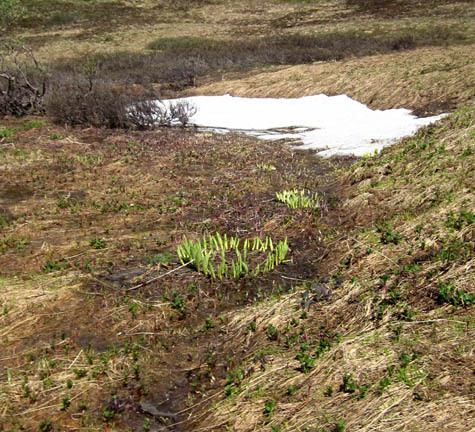 are just starting to emerge where the snow has very recently melted. Because the trail was so muddy and slick, some people coming down were walking through the low alpine shrubbery and other plants. 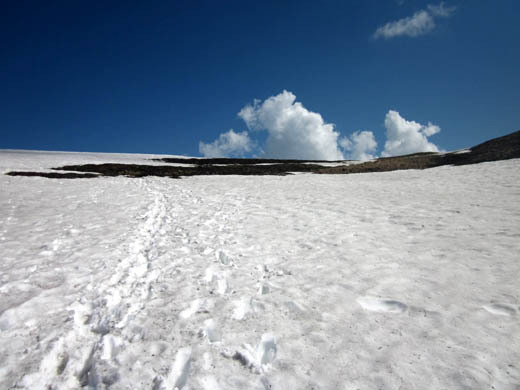 It was easier to get traction going uphill so I stuck to the wet trail as much as possible. 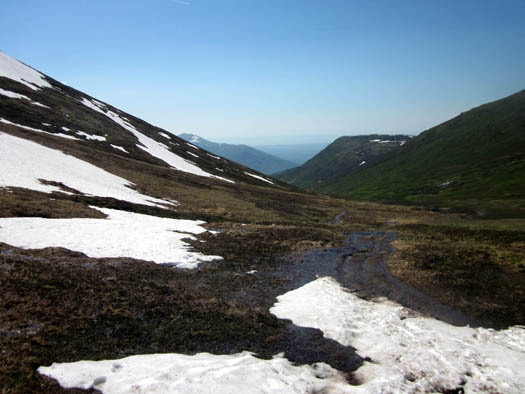 A few hundred yards below the saddle I left behind the low shrubs and entered the alpine zone. The scenery was even better when I reached the first saddle. I was filled with anticipation of beautiful mountain and valley scenery from the first plateau and I was not disappointed! The views are gorgeous from this saddle between Mount Gordon Lyon to the north . . .
and Rendezvous Peak to the south. Several couples were sitting in the grass enjoying the scenery and eating lunch. Cody and I took a break here, too, for photos and a snack. I was able to take some pictures without people in them. 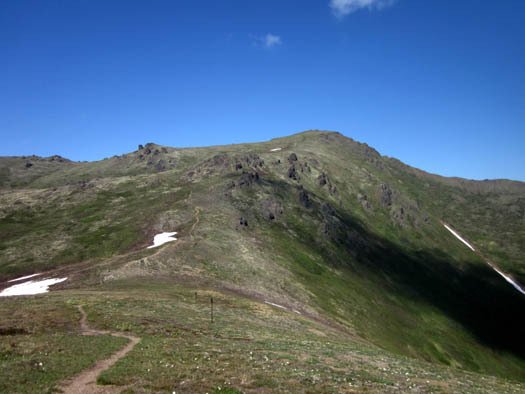 Even though the peaks I saw are only 4,000 to 8,000 feet high I felt like I was in a much higher mountain range similar to the San Juans near Silverton, CO.
go up to the saddle between Rendezvous and Little Teton peaks, where you have several more choices of trails to take. I took a total of 191 pictures on this hike and the drive through Arctic Valley. While editing them I whittled the total down to 159 (hey, that's pretty good for me!). Since I'm including about 60 of those in this entry I'll spread the photos over two more pages to make it easier to download them.